We’re all too familiar with the headlines of epic droughts and biblical floods. We’re told that this is what climate change looks like, and to brace ourselves because this oscillation between too little and too much water is the new normal. 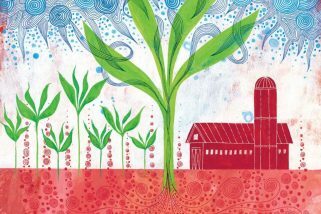 Although rarely discussed, healthy carbon–rich soil has an amazing attribute that should not be overlooked: the power to clean and store fresh water. Could it be that rising water insecurity is also a symptom of widespread soil degradation? While it may sound strange to those of us not engaged in agriculture, we need to think about soil and water as going together. Without moisture, soil dries up and cannot sustain life. Meanwhile, water falling from the sky in the form of rain and snow needs to find a welcoming place to land or it runs off the land’s surface. Healthy, fertile soil that is covered with vegetation or crop residues is more likely to allow water to penetrate than degraded soil. When runoff happens you may get flooding and soil erosion. And, if the water washes away, below-ground aquifers and the soil itself aren’t recharged. Healthy soils have structures that hold water in place. Nature builds these structures with the help of flourishing soil biology creating a network of air and water passages, or “pores.” The presence of soil structure makes it possible for plant roots to grow down deep and hold soil in place while allowing water to permeate the soil. It should come as no surprise, then, that plants with deep-rooted systems like perennials facilitate the storage both more soil carbon and more water. 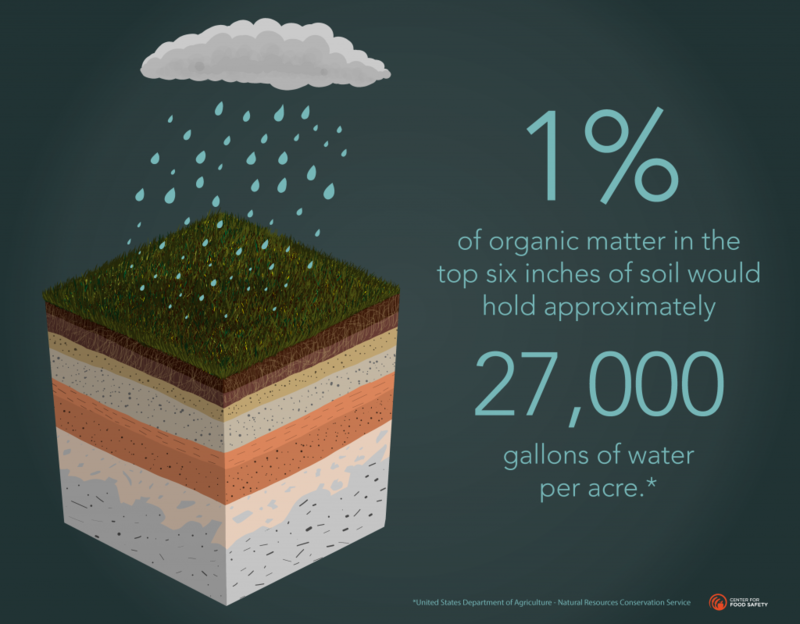 Typically, as the percentage and amount of carbon or organic matter in soil increases so does the soil’s water holding capacity. Not only does the addition of organic material to soils enhance their ability to absorb and hold water, but it helps to regulate soil temperature, protecting plants from of extreme cold and heat. This relative constancy is critical considering the longer, warmer summers we now face in many parts of the globe.